Collins and Jordan are classically trained musicians who first toured together as part of five piece band, Over Under Yonder. Collins composed most of the songs that appear on their album, Journey Onward, as she thru-hiked from Maine to Georgia on the Appalachian Trail in 2006. 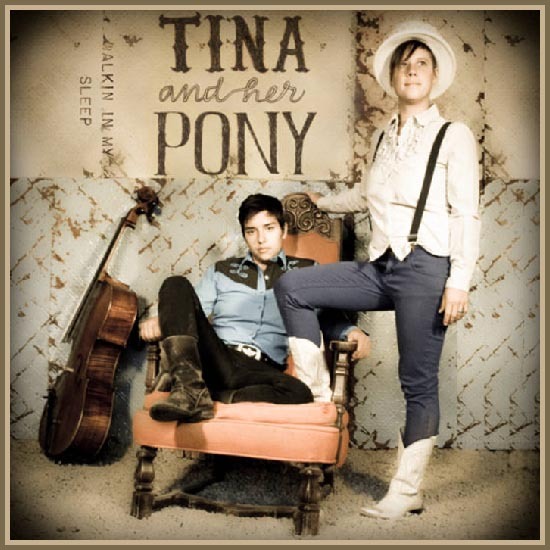 When Over Under Yonder finished touring in 2010, Collins and Jordan, recognizing an obvious synergy, split off as Tina & Her Pony. The duo spent the next two years writing and performing new music together in Taos, New Mexico, the place where Tina & Her Pony forged their signature sound of delicate, haunting harmony and exposed instrumentation on cello, tenor ukulele, and acoustic guitar. Originally from Cincinnati, Ohio, Collins grew up listening to folk legends like Joni Mitchell, Bonnie Raitt, and Nick Drake, as well as Appalachian musicians such as Loretta Lynn, The Carter family, and Doc Watson. Born in Vancouver, British Columbia, and raised in Tampa FL by her Guatemalan single mother, Jordan spent her young life salsa dancing at family parties and singing hymns in her church choir. She started her classical training at the age of 8 and began writing music at 14 years old, largely influenced by Russian Romantic Composers and artists such as Radiohead, Elvis Presley, and Johnny Cash. Cost: Free Admission: Donations Welcome!